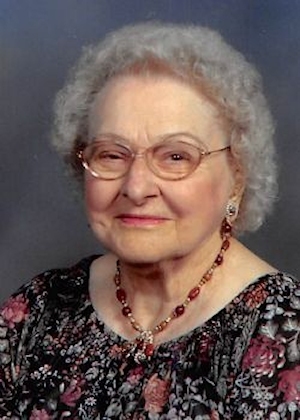 Obituary – McNeal, Betty Janey (Sykora) « Perry High School Alumni Association, Inc.
Betty J. McNeal, 89, passed away Saturday, June 21, 2014 at the Golden Age Nursing Home in Guthrie, Oklahoma. Services are under the care of BrownDugger Funeral Home in Perry. A graveside service will be held at 10am, Thursday at McGuire Cemetery in Lucien, Oklahoma with Reverend Mariyanandam Mario Pulugujju officiating. Betty was born on January 27, 1925 to William F. and Mary Ann Jilek Sykora in Perry, Oklahoma. She attended Rose Hill and graduated from Perry High School. After graduation, she went on to attend college at Wichita University. On April 18, 1947, Betty Sykora was united in marriage with the late, Glenn McNeal and to this union two children were born. Betty attended St. Rose of Lima Catholic Church in Perry and was a member of the Altar Society. She enjoyed participating with the senior citizen center and served the at Lions Club luncheon every Thursday for many years. Betty enjoyed quilting, gardening especially African Violets, doing yard work, and loved cats specially Siamese and Manx. Betty is survived by her daughter, Glenna McNeal of Guthrie two sisters, Arlene Keating of Del City and JoAnn Brown of Janesville, Wisconsin one stepdaughter, Paula Scott and her husband, Ron of Butler, Missouri two grandchildren, Merta Litke and her husband, Scott and Warren Scott and his wife, Tracy and seven greatgrandchildren. She was preceded in death by her parents, her husband, one son, Glenn McNeal Jr. and one sister, Maxine Reschke. Memorials may be made to Companion Hospice Oklahoma Diabetes Association, Oklahoma Arthritis Foundation, Oklahoma Alzheimers Association or St. Rosa of Lima Catholic Church in care of BrownDugger Funeral Home 1010 N. 7th, Perry, OK 73077.